recording the NT into Arop-Lukep. This session is done! We now have over 70% of the NT recorded! which is only open weekdays. But to host a Bible dedication, the hosting village plans months ahead. in June there will be enough food to feed his guests. -how big of a garden? -where should the garden go? -what will we plant in it? create that plate of food for you. take, and say 'that's it.' and walk out. No mistakes, no re-takes, perfection. by far the best reader I've recorded yet. village. He is proud of his ability to read the Scripture. That's a boast I can get behind. someone might find this interesting.' If I HAD to label it. 1/2 what is happening in PNG that is glorifying God. (aka What's God doing). and so I was wondering, why did that language adopt English numbers. side two plus two" No wonder they have switched to 'English' numbers! language. Zeros are called eggs. So one hundred is "One egg egg". Hmmm. an egg is a something. Why is that on my blog you might ask? 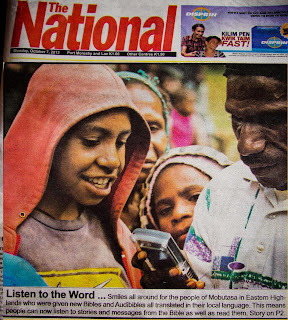 next PNG generation in PNG appropriate ways. flights to return to the U.S. in June 2014. It's 5 - 1 week vacations to Disneyland. a really nice 3 week vacation in Hawaii for a family of 4. "Check out my new car!" As in "dude your clothing is way too… "
But it could mean 'way too cool' or 'way too loud' … you never really know. This blog post is way too. No I don't know. I really don't know. "I was feeling pretty… you know…. And then I went to the place, you know." 'way too'. It'll be trendy and vague all at the same time. phonetically, after a while, you pick up certain patterns and phrases. like one tries to get up speed before running up a short hill. After sensing these patterns, somehow you know when a mistake is made. seeing an error that they don't catch. no idea why they were laughing. Were they laughing at me? Did I say something funny? Stupid? myself... and the hilarious part was.. I was right! right, I don't know the language." silence the click... when the guys looked at me astonished. technician is supposed to pay attention to. doing 3 chapters of Matthew before lunch. beginning on Matthew, finished chapter 1. Time for lunch break. was reading and the mic was picking it up. "yu no ken touchim papel"
the proper tok pisin word for paper would be 'pas' not 'papel'. mind. The reader instantly put his hand in his lap and he was fine. We made the cover of one of the country's newspapers! Someone found this and told me about it. I'm very excited about this. Raising interest among ex-pats is one thing, and easily done. Raising interest to get an AudiBible for nationals is also not hard to do. 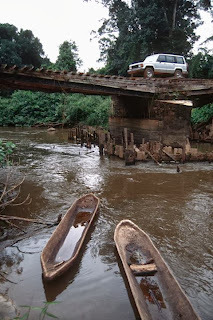 BUT raising interest to BEGIN a Bible translation is much harder. People just don't ask "what will it take for me to get a Bible in my language?" In some places it happens, but in others you have to push the need, explain how God's Word can change lives for the better, without making it sound like a promise or gaurantee. I don't know how the language teams do it, but I know that getting our product on the front page of the Newspaper is bound to generate interest. the scenery, sometimes it's the people, today it was the Scripture. -I'm looking at the Word of God and have no idea how to read it. -But it is God inspired words, even though I can't read them. -But I'm recording it, I get to record it. -Some people who will be hearing this can't read. celebrating afterwards. I should be celebrating more! My son had all his money stolen yesterday. K200, or $100 USD. My wife was escorting a guest with some friends to the market in K92 which is a well known hangout of pick pockets. For years now, every time we go into town, the kids ask "can I bring a camera, can I bring my money" and my response has always been the same "only bring what you're prepared to have stolen." This particular trip I wasn't there to remind him and my son brought his wallet with all of his cash in it along to the market. You have to know my son at this point to know exactly that that comment meant to me. My son is a miser. He's a penny pincher. He gets no allowance, and has to do odd jobs to earn money. If he's doing a job for me, and I don't like how he's done it, he has to redo it or he doesn't get paid. My son doesn't burn through money, he sees something he may want, and determines it's quality, how long it may last him, and if he'd rather not save the money. The only place he really spends money is on other people. Freely, and generously. I respect the way my son handles money. He denies himself so he can bless others. Saving up 200 kina would have taken him over a year, more likely two. My instinct as a dad, was to completely solve his problem, and dig up the 200 kina myself and give it back to him. My desire was to completely protect my son from this blow. He's a sensitive boy. I called him into the room. "Son, tell me about the day"
he instantly began to tear up, and couldn't choke out the entire story before sobbing. Then it hit me, this was a teachable experience, a dad/son moment, and if I did this wisely, he'd both learn from it, AND be comforted. "Son, what do I always say before we go to market?" "don't take what you can't afford to lose...."
"it sounds like you lost it all"
"Well son, let me tell you about how we live. When people rob from us, we can sometimes get some of the things back through insurance, and the rest of it, we need to learn to be okay with losing. I know it hurts, and it makes us mad, and we are tempted to want to hate the people who stole from us. But we can't hate them. We have to love them anyways. And we can't let it make us think that EVERYONE at market is bad, or everyone in this country is bad. We have to learn not to let ourselves be angry." son: "I'm not angry dad, but I'm sad, they took my store card too." me: "Well, when I file an insurance claim, I don't get it all back, I get a percentage of it back, like when we had that breakin and all my tools were stolen. I didn't get everything back. So, what if I was your insurance here, and I gave you back 170kina?" me: "I can't give it all back to you, but I can help with some. And you can consider this a 30kina lesson well learned instead of a 200kina lesson painfully learned." My son didn't speak, but I handed him the money and he lit up. He went away and returned a few minutes later without saying a word but with 4 little smarties in his hand and handed them to me. I don't know exactly what was going through his head, but his moping stopped... and I'm hopeful he learned something. And I learned something to. A dad sees the things that are going to happen sometimes. I told the kids for years, warned them against the likelihood of being pickpocketted. I'm frankly surprised it hasn't happened before. I saw it coming, I warned my kids, it happened anyway, and I chose to let them learn from it, while softening the blow. At first I had a selfish thought... to me like "I knew this would happen, I tried to warn them... and now I'm the one who ends up suffering"
and it hit me.. that's what parents do. It's what mine did. And I was totally okay with that. Radner would say "I'm Susanna, Susanna Danna" (or something like that). which means "all different kinds of work"
It's been a long time since I've done any fun videos, been too busy. it is a feat of balance. in a fun, quick little way. village churches I've ever been too. tell us about your work." people who have come for 2-3 weeks to do some work, please tell us about it. they stood up and introduced themselves and what they were here to do. People kept introducing themselves, lots of first timers this Sunday. And still Pastor Willie kept looking at me saying "anyone else? silent lipping of 'don't worry about it, it's covered.' type of thing. children, thanks for having us here, we're happy to be here." introducing myself and shaking hands. experience I've had to date. me for the next 5 weeks. 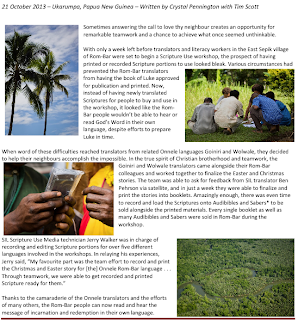 Sokarek dialect translation nearing publishing. training into people that you end up losing. But it happens almost weekly. and then leave and come home?' The answer is a long list of reality. But it would be our goal to get sustainable, and repeatable training. On an up note! We just found, and hired our first PNG audio technician! own audio recordings, we'll see Audio impacting the nation like wildfire! in a little over 1 month I turn 40.
things I simply can't do. "Things I Can No Longer Do"
-I can no longer remember the rest of this list. We bought 2 identical Chinese/Png clocks 5 years ago and yesterday they both stopped working. Tried replacing the batteries. Took apart and lubricated one. Nothing. Totally dead. One was always 10 min slow the other 10 min fast. Good clocks are hard to find in country. The first time my son heard it he said "that is creepy!" I replied "having two clocks die on the same day wasnt creepy?"